Built between 1924 and 1929, the Arapuni Power Station and Dam was the first government-built high dam constructed on the Waikato River. It pioneered the development of the Waikato Valley Hydro Electric Power Programme which was carried out between 1929 and 1966. Arapuni Dam and power station, 1929. Alexander Turnbull Library, Wellington, New Zealand. The diversion tunnel was completed in July 1926, and the site dewatered soon after. Good progress was made with the head works, but at the power house site there was disagreement between the contractor and the Public Works Department (PWD) over the suitability of the foundations. The impasse was broken when the PWD took over the works in December 1927. The completion of the power station and dam was an important first step in harnessing the Waikato River for hydro electricity production. This became an important issue in the mid-20th century. 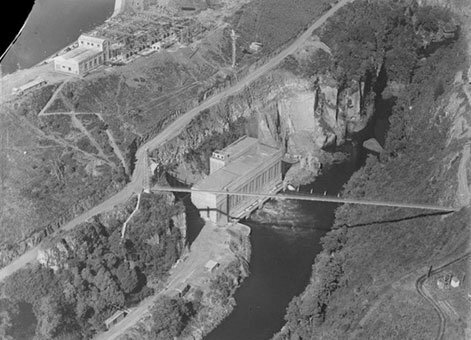 A 1947 film, Power from the River, highlights the limitations of the North Island's electricity supply at that time, especially during peak evening hours, and promoted the construction of Waikato River power stations to supplement the supply from Arapuni. Six other stations were constructed as part of the scheme, including Maraetai, the only one with larger capacity than Arapuni. 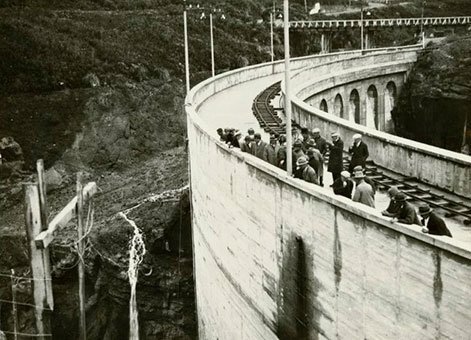 In mid-1930 a crack developed between the end of the Arapuni Dam's spillway and the adjoining structure. There was a small but definite movement of the ground above the powerhouse – a movement that partly reverted when the spillway water level was drawn down to empty the headrace. The station was shut down and not put back into service until April 1932. Hydroelectric station at Arapuni, with visiting members from the Society of Engineers (circa 4 November 1930). Alexander Turnbull Library, Wellington New Zealand. A powerhouse extension, doubling the original size, was built between 1934 and 1937, and two more machines installed by February 1938. The final two machines were delayed by wartime disruptions, but were eventually commissioned by October 1946. This brought the station to a total capacity of 164 MW, by far the largest in New Zealand at the time. Stage One of the refurbishment involved the construction of a diversion channel incorporating four radial control gates to enable the full Waikato flow to be diverted away from the Arapuni headrace and intake structure. Stage Two involved the replacement of the headrace lining, channel widening and the raising of the existing intake platform and spillweir. The tailrace was deepened and a radial gate installed to control the tailrace water-level. The new structure resulted in increased flood storage capacity of Arapuni Lake, helping flood control of the Waikato River. 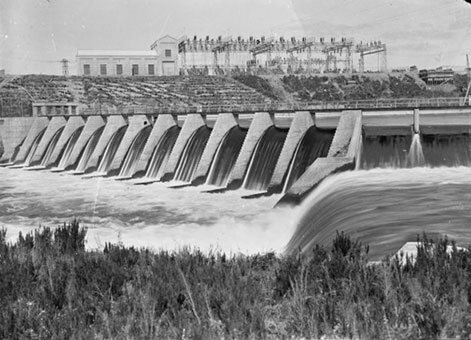 Arapuni Hydroelectric Power Station, Waikato (1937). Alexander Turnbull Library, Wellington, New Zealand. The dam is 64 metres (m) high from its foundations to the roadway running along its crest, and raised the water 42.7 m above its old level. The water then flows about 1.2 kilometres (km) in an open headrace, and then through penstocks to the powerhouse at the base of the gorge. The powerhouse is a reinforced concrete structure 136 m long, 22.8 m wide, and 22 m from tailrace water level to roof. The power station can be viewed from the road or by walking over the impressive suspension bridge overlooking the building and dam. The suspension bridge is part of the Waikato River Trails. View of the Arapuni Dam and power station, 1929. Ref: APG-1596-1/2-G. Alexander Turnbull Library, Wellington, New Zealand. Hydro electric station at Arapuni, south Waikato, with a visiting group of members from the Society of Engineers [circa 4 November 1930]. Ref: 1/2-C-027085-F. Alexander Turnbull Library, Wellington, New Zealand. Arapuni Hydroelectric Power Station, Waikato . Ref: WA-55976-G. Alexander Turnbull Library, Wellington, New Zealand. Arapuni, 16 km from Putaruru off State Highway One.